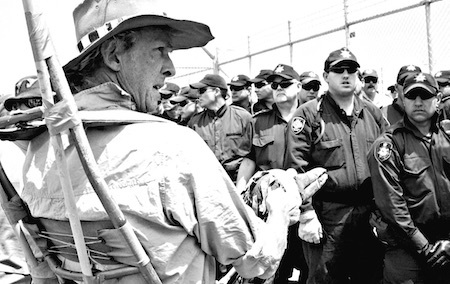 Above, from left: 1987 Pine Gap protesters John Rumble, unknown, Richard Tanter, Russell Goldflam, and the late Hal Alexander. Photo from Russell Goldflam’s personal archive. 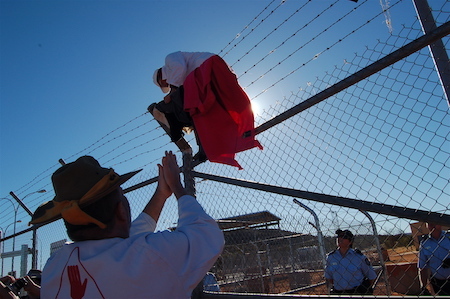 Below: Over the fence in June 2007 (Alice Springs News Online archive). When Scott Ludlam asked at last Friday’s public meeting about Pine Gap who’d been here for the 1983 Women’s Camp, and the 1987 mass arrests, I proudly stuck up my hand. Some of us who did back then what folk have been doing this past fortnight are no longer with us. I pay my respects, remembering fondly their courage and good cheer, to my friend Pip Duncan, to my comrade Hal Alexander, to the extraordinary polyglot activist Alexander Prus-Grybowski, to Kanak leader Alphonse Dianou, who tragically took up arms and was killed in his nation’s independence struggle, to my client Bryan Law, and to my dear sister Annie Goldflam, all of whom I have been privileged to agitate with, and at times to become agitated by, along the road to Pine Gap. What have we learnt from past campaigns? Well, the biggest lesson, the hardest lesson, the elephant in the room really, is that we are now much further from closing Pine Gap than we were, or at least we thought we were, 30 years ago. Pine Gap is more entrenched, more embedded, more entangled, more powerful than ever. Our campaigns, colourful, imaginative, bold and passionate though they have been, have not yet succeeded. They have not galvanised public opinion, like the Save the Franklin campaign did in 1983, or like the asylum seekers and refugee support campaigns are doing now. During the mass protests in the ’80s when there were over a hundred of us at a time on the wrong side of the fence, we must have posed a real threat to the security of the base, but we were all only ever charged with the minor offence of trespass. Things changed after September 11 2001. In 2005, Jim Dowling, Adele Goldie, Bryan Law and Donna Mulhearn, with their conspicuous white overalls, conducted their ‘Citizens Inspection’ of Pine Gap. Although they didn’t pose a threat to the security of the base, they got charged with far more serious offences, the very first time the Defence (Special Undertakings ) Act had been used in the 53 years since its enactment to thwart any spies who might be lurking near the Monte Bello Islands, where the Brits were conducting top-secret nuclear tests at the time. So the peace movement ebbs and flows. Which brings us to a third lesson: keep a weather eye out for those global currents and tides, and trim your sails accordingly. Be opportunistic and catch any lucky puffs of wind you encounter. But also, be strategic: be alert to the deeper shifting patterns. The Pine Gap 4 did just that: brilliant opportunists, and deep thinkers. They got lucky, legally speaking, but they also made their own luck, and they rode it with ears and eyes wide open. 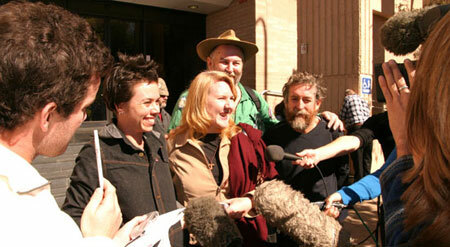 Right: Outside the Alice Springs courthouse, the Pine Gap 4 speak to media, from left, Adele Goldie, Donna Mulhearn, the late Bryan Law, and Jim Dowling, who returned to Alice this year and once again entered the base. Photo from Alice Springs News Online archive. At their trial, the Pine Gap 4 tried — and failed — to convert their theology into the viable legal defences of defensive conduct and necessity. They argued that they were responding to a sudden or extraordinary emergency. They knew that the war in Iraq was illegally killing defenceless people daily, and they honestly and reasonably believed from their researches that Pine Gap was being used to prosecute that illegal war. They had written letters, and gone to demonstrations against the war, to no avail. And so their hearts told them it was necessary to come here to Pine Gap, to disrupt its operations. And what is more, their actions were restrained, non-violent and a reasonably proportionate response to the appalling evil they needed to avert. But their judge, like others before her, instructed the jury that in Australian law a defence like this could not be raised in circumstances like these. Even so, the jury members, visibly moved by the testimony and sincerity of the unrepresented accused, took five hours to examine their consciences before bringing in the all-but-inevitable guilty verdicts. In a similarly sympathetic spirit, the trial judge rejected the prosecution demand for gaol time, and instead imposed modest fines. And then the Pine Gap 4 caught a little lucky puff of wind. Left: The late Robin Laidlaw’s emu parade in 2004 (Alice Springs News Online archive). The Crown appealed, on the ground that the lenient punishment for these crimes of conscience had “shocked the public conscience”. But before the appeal was heard, Kevin Rudd’s new government was swept to power on the back of a campaign which prominently featured a commitment to withdraw Australian troops from Iraq. In that light, the Crown claim that the public had been shocked by the mercy shown to four peaceful trespassers agitating for an end to such an unpopular war looked absurd and vindictive. And then that lucky little puff of wind turned into a gust. Donna Mulhearn had approached former Federal Court judge Ron Merkel QC for help. And Merkel poked around and found a tiny wormhole in the Defence (Special Undertakings) Act out of which he magically pulled, one after another, some slender but elegant legal propositions which didn’t really look as if they could possibly amount to much, but when strung together were sufficiently robust to drag down the entire Crown case. In the event, the Crown never even got to argue that the sentence was shockingly lenient, because the appeal court unanimously threw out the jury convictions. And when something like that happens, the media flock like seagulls to a bucket of chips. If you want the gory legal details of the case, you can read my 2008 article “Satellites, Citizens and Secrets”. To the defendants, the Crown’s conduct of the case was a ham-fisted and oppressive waste of time and resources, typical of the obsessively secretive hyper-sensitivity that has long been associated with Pine Gap. And to the Crown, the smilingly obdurate defendants were frustratingly difficult to contain, both legally and politically. Throughout the proceedings the Pine Gap 4, as Christian pacifists, repeatedly turned the other cheek. And, as tactically astute and audacious activists, they also showed a lot of cheek. The mix was beguiling and exasperating, subversive and empowering. They astutely took advantage of the allowances accorded by the court to unrepresented accused. They complained to the jury that they had been singled out for prosecution under the Defence (Special Undertakings) Act, about the evidence they had wanted to call which had been suppressed, of the ruling to withdraw all their defences, and that they were facing lengthy prison terms, all submissions a barrister would never have been permitted to make. The Crown’s objections, however technically sound, were often counter-productive because the accused, who quickly figured out how to impress a jury, could not be made to play the justice game by the conventional rules. Civil disobedience exposes those who engage in it to the risk of the ordeal of litigation, to substantial penalties, and to public opprobrium. But it also exposes the state to risk: police and prosecution agencies may be embarrassed, confidence in the legal system can be impaired, and public support for important government decisions can be undermined. 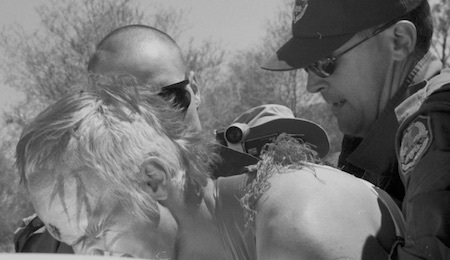 Right: Supreme Commander Starpower (these days known as Starlady) manhandled by police outside the gates of Pine Gap in October 2002. Photo by RAINER CHLANDA from Alice Springs News Online archive. The Pine Gap 4 won a spectacular but incomplete legal victory. Their case was unprecedented, but is unlikely to establish much of a precedent. Pine Gap remains a prohibited area, entering it remains illegal, and the Crown could have simply avoided repeating the debacle of this failed prosecution by resuming their previous reliance on the trespass provisions of the Crimes Act. This week though, there was another little puff of lucky wind: once again, the prosecutors elected to prosecute using the Defence (Special Undertakings) Act, and once again they got egg on their face. I’ve heard they’re considering an appeal. It would appear they haven’t learnt their lesson. Which is all the more reason why we should learn ours. Note: Russell Goldflam is president of the Criminal Lawyers Association of the Northern Territory. This article is a slightly edited version of the presentation he made on Saturday 1 October to the Independent and Peaceful Australia Network (IPAN) conference in Alice Springs. Thankyou for publishing Goldflam’s article setting out personal detail, history and context of the manner in which the Australian ‘Crown’, in some situations, relentlessly, and in unkindly manner sets out to prosecute citizens who are not criminals but citizens who do what they can to shake the brain inside the ‘Crown’. The insane destruction in Aleppo, the brutal bombing by the Saudis of the funeral in the Yemen, do prosecutors acting for the Crown really support such actions ? Goldflam’s modest example helps address local crime and international crime. He is to be thanked for the humour and balance he brings to such harrowing conflicts of interest.